Find your ancestor in this list! There were a few surprises when searching for photos of footballers of the Geelong Football Club – particularly the number of descendants [grandchildren] who had no idea their ancestor had ever played for the Geelong Football Club, let alone played football at a senior level. Apart from searches that come up on NLA Newspapers [TROVE], I guess it would only be from oral histories passed down through the family. 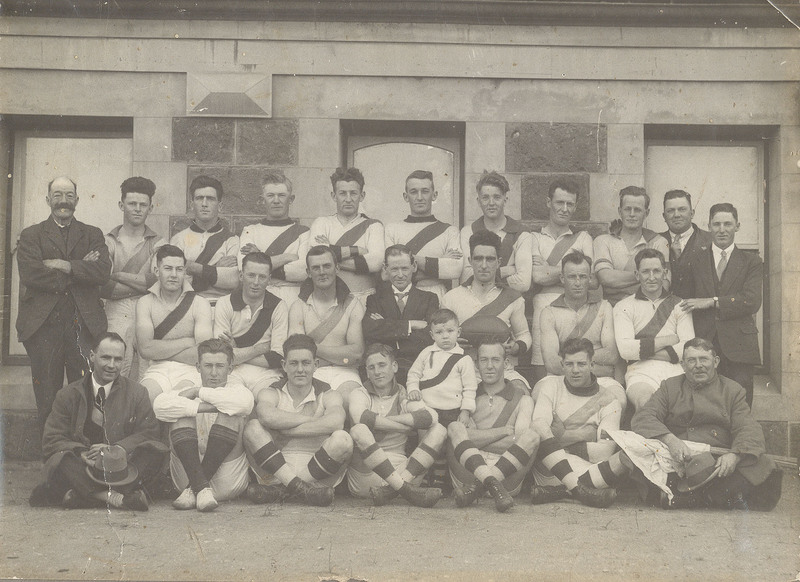 Many family or local history societies will have a collection of football teams similar the this image – all players and officials were clearly identified in this one from the Bellarine Historical Society. I wonder how many groups have the names from this project amongst their football photos? The Geelong Cats are nearing the end of an enormous project. We have spent the last several years, gathering images of every player who has played with Geelong, since 1877… whether he played 1 game or 300 games. As of today we have gathered around 1117 images, and we are now only looking for 206 to complete this exciting work. We don’t expect to get an image of the player in a geelong jumper. The best style of image is a football team photo, where he is looking straight into the camera. wedding images are also good as they usually show this “face on” style of image. of course, any images will be helpful! We are looking to complete this work before the end of the year and so, we need these images before 20th December 2014. The most recent appeal for photos in November uncovered 50 photos for this project, so the required list is getting smaller. Please check the list carefully to see if you can identify anyone.